Okay, so I posted on Facebook that I was super-pleased with the response to my Shrimp n’ Grits post and that I was looking for ideas on what to post next. I have quite a few idea/pictures in the queue, but my buddy Alex (see his comedic offerings linked on the right there) suggested that Super Bowl food would be appropriate choice. Then, my friend Keith (see his funny blog on the right there, too!) mentioned pizza, so the decision was made. Granted, I don’t think that I have all that much to contribute to the plethora of pizza recipes out there, but I know what I like, and maybe my tastes will be new to some. As for toppings, there are several that we turn to when making homemade pizza, most of which are on the vegetarian side. 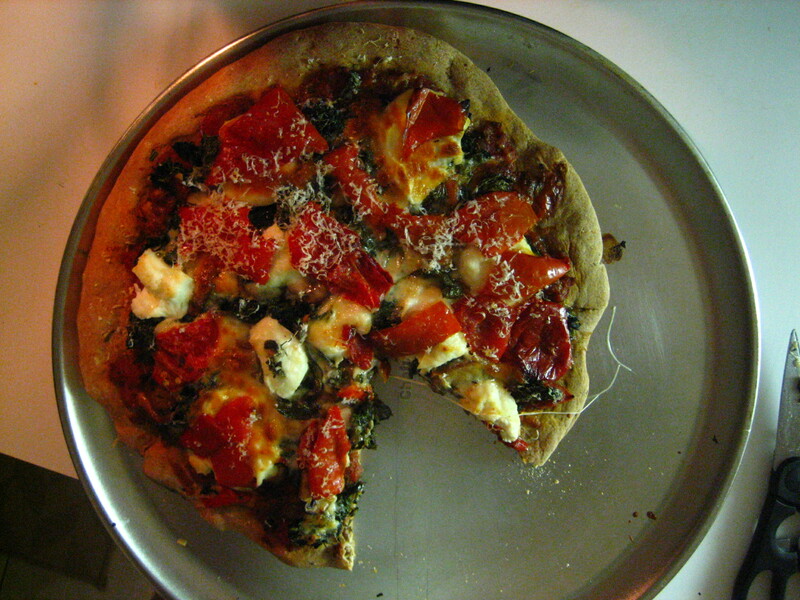 In fact, the pizza shown above is one that we made when our friends Mark and Erica decided to challenge us to a vegetarian week of dinners; it was a good way to get ourselves to think about how to get a balanced meal without eating meat. You’ll see that we used a red sauce (just crushed tomatoes seasoned with fresh garlic, dried oregano, salt and pepper). Over the sauce, we added mushrooms sauteed with thyme, roasted red peppers, spinach (thawed from frozen), Ricotta and Parmesan cheeses, and fresh basil, which elevates the flavor of most red-sauce pizzas. The result was so delicious that we couldn’t even wait to take a picture before we’d both had an enormous slice. If you are looking for a veggie pizza (and provided that you still eat cheese), this combination can’t be beat. *There are several good brands of whole wheat flour available these days, including a few that say you can use them in place of regular all-purpose flour (I suggest testing a recipe out on yourself before serving guests). Trader Joe’s brand is the one we used in this recipe, and it worked really well. Let me know if you have any other suggestions!